Your Rocky Mountain lodge hosts are Gina, D'Arcy Marcell and Sookie, transplants from the Pacific Northwest. Offering Colorado mountain lodging comes naturally to Gina through her background in hospitality and 30 years in customer service in the Travel Industry. Gina is a true entrepreneur who enjoys people. She owned her own businesses while raising three sons. She enjoys cooking, entertaining, and sharing her knowledge of animals, especially of goats. Gina became a passionate lover of goats after adopting some orphaned baby goats. That experience grew into a hobby of rescuing unwanted goats, rehabilitating, and then re-homing them as pets. Gina has mentored all aspects of goat husbandry and will continue to educate others to the benefits of goat ownership. Gina enjoys making goat cheese and uses fresh goat milk, goat cheese, and fresh eggs in the wonderful meals serves to guests. Besides making a mean Latte, D'Arcy is the techie at this Colorado mountain getaway. Recently retired from the marine industry as an Electrical Officer in the oil fields of Mexico, D'Arcy is an invaluable resource for all kinds of maintenance. A talented handyman D'Arcy can fix "almost anything" and also enjoys carpentry. D'Arcy has traveled extensively in his career and looks forward to exploring Colorado in his free time. The Marcells have a herd of dairy goats and share their love of these entertaining creatures with B&B guests and the community at large. After realizing that the wet climate in the Pacific Northwest was not conducive to healthy goats, the Marcells began to look for a sunny climate where they could own an Inn and also where their goats would thrive. The Mountain Goat Lodge was the perfect solution! © 2019. 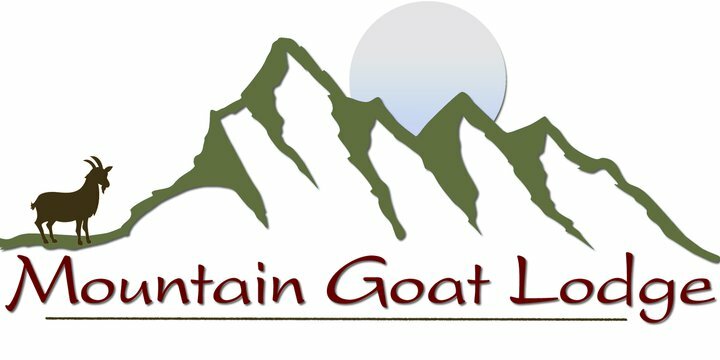 Mountain Goat Lodge. All rights reserved.